In 1841 Heaton Champion de Crespigny (1796-1858) was living at Pyrton, 13 miles south-east of Oxford, with his son Augustus and a 15 year old servant Jane Lovegrove. His occupation was recorded on the census as clergyman. 1841 England census retrieved through ancestry.com Class: HO107; Piece 884; Book: 3; Civil Parish: Pirton; County: Oxfordshire; Enumeration District: 1; Folio: 9; Page: 9; Line: 12; GSU roll: 474574. The census was taken on Sunday 6 June 1841. It was the first of the modern censuses in the United Kingdom and the first to record information about every member of the household. Each householder was required to complete a census schedule which contained the household address and the names, ages, sexes, occupations and places of birth of each individual living at the address. These schedules were then copied by the enumerator in the official books, which were known as the ‘Census Enumerator’s books’. As the original census schedules have been destroyed, it is the census enumerator’s books that researchers can see. The census is a snapshot of the family in June 1841 and to understand it you need to look at the events leading up to that time. Heaton Champion de Crespigny had married Caroline Bathurst (1797-1861) in 1820. She was the daughter of the Bishop of Norwich. Thanks to the efforts of his father-in-law Heaton was ordained shortly before his marriage despite not completing his degree at Oxford University. Heaton was appointed the Vicar of Neatishead, Norfolk and the Rector of Stoke Doyle, Northamptonshire in April 1822. In 1828 Heaton fought a pistol duel with Mr William Pole Tylney Long Wellesley, who had defamed Heaton’s father. The matter later went to court, which found against Long Wellesley. Heaton’s role in the affair was not to his credit. Later in 1828 Heaton attempted to blackmail his cousin the Earl of Plymouth. He was imprisoned but was bailed by friends and committed to a lunatic asylum. In 1833 Heaton was declared insolvent. Shortly afterwards he resigned as rector of Stoke Doyle. In 1839 Heaton and Caroline’s son William died at Great Hasely, Oxfordshire (close to Pyrton), aged 16 years six months of a “diseased heart”, possibly cardiomyopathy. The informant was Eleanor Smith who was present at the death. In 1841 Claude, aged 11, was at school in London at Christ’s Hospital, the Bluecoat School. Heaton, as mentioned above was living in Pyrton, Oxfordshire with a young son. Caroline and the other children are not recorded on the census. I assume they were then living in Germany. It has been suggested that Caroline met the author Thomas Medwin at Heidelberg in 1841. In 1842 at the age of 21 Eyre graduated from Heidelberg University with a medical degree. Heaton travelled to Australia in the early 1850s and tried gold mining. He was also briefly appointed as a magistrate on the goldfields. Augustus accompanied his father to Australia. Heaton died at Ballarat on 15 November 1858 of apoplexy. He is buried in an unmarked grave. On Heaton’s death certificate in 1858, Augustus is the informant. Augustus returned to England where he is on the 1881 census. He later migrated to Texas, United States of America where he appears on the 1900 census. Augustus died in Texas in 1905. Jane Lovegrove, the fifteen year old servant who was living with Heaton and Augustus in 1841, became pregnant and had an illegitimate child, William Augustus DeCrespigny Lovegrove, who was born in late 1842. William Lovegrove named his father as Heaton on both his marriage certificates. Heaton is my second cousin five times removed. I have previously written about John Horsley (1776-1834), who married my 5th great-aunt Maria Champion de Crespigny (1776-1858). Their marriage broke down and John Horsley emigrated to Australia in 1814. Maria remained in England. In November 1828 the first census of the colony of New South Wales was held. There were 36 598 non-indigenous inhabitants. 20,870 of these were free and there were 15,728 convicts. 23.8 percent of the population had been born in the colony. 24.5% of the population were women. There were 25,248 Protestants and 11,236 Catholics. Aborigines were not counted. There are two copies of the 1828 census: an Australian copy, which had been locked away and only became available for viewing in the mid 1970s, and an English copy that has more errors and slightly less detail than the Australian copy. John Horsley was among those counted in 1828. The mother of John’s children, Jane Horsley formerly Cross née Jackson, is listed as Jane Cross, aged 38. She had also arrived in 1814 on the Broxbournbury. Her occupation is given as housekeeper for John Horsley, Coroner, Liverpool. 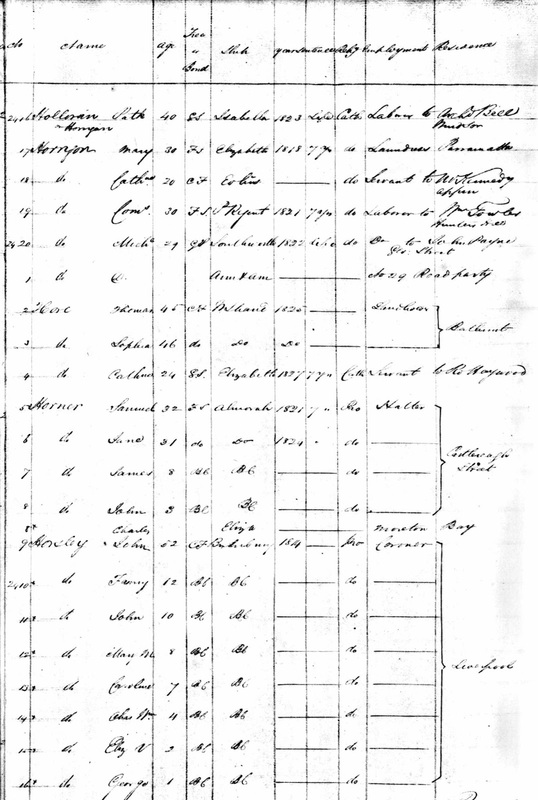 The English copy of the census record for John Horsley and his children is easier to read but doesn’t give the information about his land or cattle. Foster, S. G. (Stephen Glynn), 1948-, Aplin, G. J. (Graeme John) and McKernan, Michael, 1945- Australians, events and places. Fairfax, Syme & Weldon Associates, Broadway, N.S.W, 1987.